While it may not feel it just yet, Spring has officially sprung! For me, this gives me the encouragement that brighter and warmer days are soon to come and for that reason I like to pick up a few new finds I will be glad to have once the weather catches up with the new season. Here are just a few of my Springtime bargain finds that cost as little as 99p (all free p&p)! Hope you find a few bargains you like from this little lot! For me, a new season always calls for a new bag. 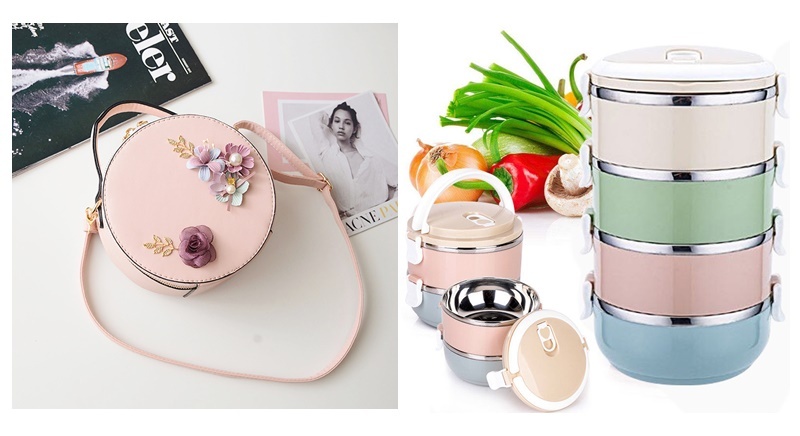 For the past few years I've prefered something more compact especially come spring/summer when I don't want anything heavy to lug around so this round but deep circular bag is a perfect choice! Available in white, black, light pink and light grey with gold hardware this really is a cute find! Of course, I love the applique detail to this bag but I also love that the longer handle can be detached and you can carry it with the smaller handle giving it a totally different look. A new season always results in new makeup purchases for me! So far already I've picked up two of these incredibly pretty blushers (these aren't fake but reduced stock like you would find in TK Maxx) that I've been so pleased with! These give the cheeks a lovely radiant glow and a flush of colour and are such a saving from the £22 RRP! I highly recommend shades 'Babydoll' and 'Matchmaker' for light to medium skin tones - these are the shades I so far have and I LOVE them! I will certainly be picking up a few more very soon. Statement earrings are certainly on trend right now and an amazing place to pick them up from at a bargain price is eBay! Not only do they have some lovely styles but you know that no one else will be wearing anything similar - a total plus! While I love tassel earrings in bold colours they are harder to pair with an outfit so I decided to share this stunning white and gold pair that instantly make me this of Bardot tops and floaty dresses, and basically summer! These earrings also come in black which give them a definitely evening vibe. LOVE these! As a casual jewellery wearer I don't often like to spend much on the pieces I wear, however they do have to look nice. So when I came across this eBay listing my eyes literally lit up as I instantly thought of the stunning bee necklace from Alex Monroe that costs around £150. While of course, the same quality isn't here in this budget necklace the aesthetics are and after picking this up I can tell you it really is lovely in person. I had to include this find with you! Dressing for Spring, especially if you don't want to stay in jeans, can be a bit of a challenge. It's neither that cold or hot and so I'm always on the lookout for long sleeved dresses because 1. they are perfect for cool days in both spring and summer and you really don't have to do much for them to look good. You can also dress them down with flats or trainers and dress them up with boots or heels - winner! Both of these dresses caught my eye as I love both the blush beige and the grey mixed with the white as they give off spring/summer vibes. My only caution would be to size up as clothing from China is notorious for being on the small size, however, sizing up one size should be enough as this is a loose smock style dress. If you didn't know already I have a total obsession with B&BW Pocket Bacs! You will find one in every handbag I own and I simply cannot be without them for keeping my hands germ-free on the go and smelling nice. As with a lot of things here it seems I like to pick up a new scent each season and try something new. The listing contains quite a few spring/summer scents such as 'cucumber melon' 'white tea' 'Japanese cherry blossom' 'sweet pea' and my favourite, 'peach bellini'. You can be sure that whichever Pocket Bac you go for it will smell amazing! Another 'inspired by' find here that I had to share as I'm a huge macaron fan and think these keychains are adorable. Available in 4 different colourways these can be clicked onto a bag or used as a keyring and are just a cute sping accessory. If the past few years through blogging and buying blog props I've discovered the benefits of buying fake flowers! All year round cheap flowers that you can bring out time and time again really is the way to go if you love flowers constantly in your home. For me, these fake blossom stems that come in 4 different colours would make perfect foliage with other artificial flowers to bulk them up and fill out a vase. To me, these look like that they are constructed out of paper which I actually like the look of as sometimes fake flowers can look too plastic-y especially on the stems. As someone that loves al fresco dining I'm already planning the picnics and their locations I want to go on this spring/summer in my head. I've also decided that a total homemade picnic rather than picking up pre-packaged food is totally more fun and yummy. Which is how I came to find these stackable tiffin boxes that you can buy one of or stack with into 4 layers. These are perfect for keeping food warm before your picnic or lunch and keeping different smells away from each other and things that would normally leak in Tupperware, safe. I also really love how these look with the pastel tones and cute heart ventilation hole. Let me know if you have found anything you love the look of here! My favourite items have to be the Ciate blushers are I can't stop wearing them and I adore the packaging, along with the bee necklace!